AIRCON: Compressors, Controllers, Condensors, Exchangers, Driers, Evaporators. BBA can give you or your customer real savings. A very large percentage of compressor problems are just a clutch,coil or bearing problem. Rather than the £350 to £800 for a new compressor, a typical clutch rebuild by us will be £100-£150. At the moment we are offering free collection. The first thing to do if an air conditioning system has failed is to check for a leak. This may seem the most obvious thing todo, but it is not always carried out! It is vital because oil is mixed with the refrigerant, so even the slightest leak willeventually lead to their being no oil in the system. This will lead to costly damage to the compressor and other components of the system. Customer arrives with aircon inoperative. Fuses are OK, clutch not operating. Refrigerant pressuresare tested OK, Control Module reveals no codes. Could be either high pressure cut out switch (cuts above approx 400psi)or low pressure (cuts out below 40 psi approx). You can very briefly use a jumper wire to test these switches. (i) Excessive refrigerant pressures, causing compressor to work too hard. This melts the bearing grease. (iii) Pulley Bearing nose housing distorts due to overheating. Bearing thus not supported correctly and fails.Call for free help and free testing. Because if you're in any doubt about whether your compressor may have brokenup and put debris in to the system we will collect it free of charge. Upon disassembly we can report back as towhether you need a new condenser, a complete system flush, or as in many cases there are no problems otherthan your clutch needs replacing.Flushing Complete system flushing is a requirement after any compressor replacement (also a warranty stipulation). Alllines, evaporator, condenser, must be thoroughly flushed with proper power flush equipment. If compressor failed badlycondenser will likely need replacement. HOW DOES AUTO A/C WORK ?Everything has a certain amount of heat except at absolute zero ( -460 degrees.F ). An ice cube may feel cool to the touch, but actually it just has less heat than your hand. That means heat is transferring from your hand to the ice cube. This is the principle behind how an A/C cools the air in a car. Heated air is forced across a cold evaporator and is transferred to the refrigerant gas, making the air less hot. The refrigerant carries the heat away from the evaporator to the compressor. The refrigerant is super heated by compression and is forced through the condenser where cooler outside air takes the heat from the refrigerant. Its next stop is the expansion device (TXV or CCOT) which meters refrigerant into the evap and we start over again. SIMPLE ISN'T IT ! WHAT DOES A DRIER DO- DRY? IT'S NOT THE FREON!! It's the oil in the refrigerant that absorbs moisture and holds debris in the system. Replacing the drier / accumulator, in addition to evacuation, will assure better performance. Be sure your new drier/accumulator has the new XH7 or XH9 desiccant that is recommended for all refrigerants. WHY INSIST ON FLUSHING there is no way to know how much oil is in a system (1) Flushing eliminates excess oil from previous services. 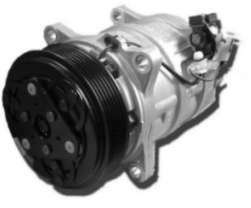 You do not want to add another full charge of oil when replacing a compressor and adding oil to the system. (2) Sludge and debris, left in the system, clogs the orifice tube/expansion valve and can damage the valves in a compressor.Technical TipsEVAPORATOR ODOR Evaporator odors have been around for years. There can be several odors in a cooled airflow:(1) "Dirty socks" odor from airborne fungus is organic material and is called an ORGANIC ODOR. (2) "Refrigerator" odor emitted by the anti-corrosion coating on the evaporator. Noticeable when the system is running very cold. This is a CHEMICAL ODOR. (3) "Cement" or dusty room odor comes from the evaporators. High performance evaps use thin alloys with high fin counts which traps water on the evap face causing the anti-corrosion coating to come off and breed the fungus. RETROFIT - NOW OR LATER? Currently, there is no law or regulation stating that a vehicle must be converted to refrigerant R134a. However, the R12 supply is running out, so if a major repair is required on a R12 system it is in the customers' best interest to convert to the R134a refrigerant. Common causes for clutch failure:1. Bearing failure: re-packed bearings have a short life. Don't use them - ITS YOUR LABOR 2. Air Gap: between the outer plate (shoe) and the belt/rotor. About .025 inch is good 3. Shorted Coil: Correct coil resistance 2 - 4 ohms. 4. Locked Compressor: excessive discharge pressure Check for restricted condensers, receiver/driers or an over charge of oil.